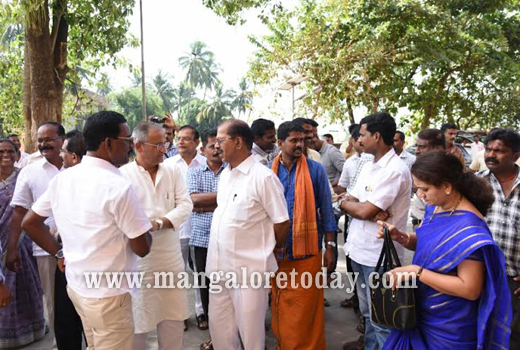 Mangaluru, Dec 7, 2015: With the MLC elections slated for December 27, sitting MLC from BJP Kota Srinivas Poojary, Congress candidate and sitting MLC Pratapchandra Shetty as well as rebel Congress candidates Jayaprakash Hegde and Bhujanga Shetty from Brahmavar filed their nominations at the DC office on December 7, Monday. 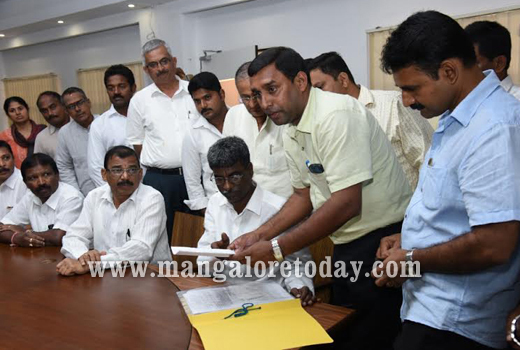 As many as six candidates, including two from national parties, filed their nomination papers for two seats from the Dakshina Kannada-Udupi Local Bodies Constituency. Serving members of Legislative Council Kota Sreenivasa Poojary (BJP), K. Pratapchandra Shetty (Congress), Praveenchandra (Janata Dal-S) and K. Jayaprakash Hegde, K. Bhujanga Shetty and A.M. Ismail (Independents), were the ones who filed their papers with the returning officer and Dakshina Kannada Deputy Commissioner A.B. Ibrahim. Kota Srinivas Poojary was the first to file his nomination. The leader was accompanied by several party leaders including District BJP President Pratap Simha Nayak, Capt. 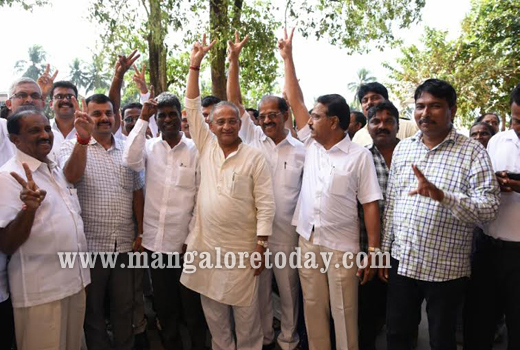 Ganesh Karnik, MLC, Angara, Prabhaker Bangera, MLAs and Sunil Kumar, MLA of Karkala and Chief Whip of opposition. Poojary who spoke to reporters present outside the DC office, exuded confidence that he would win the elections. 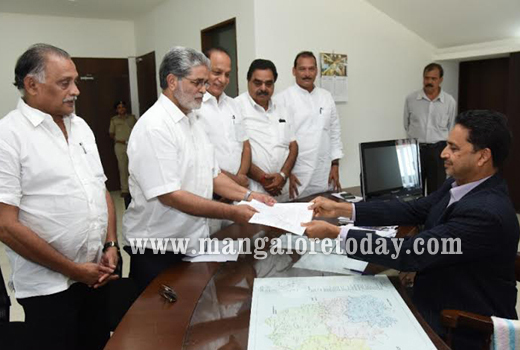 Meanwhile, Congress candidate Pratapchandra Shetty filed his nomination in the presence of State Ministers Ramanatha Rai, Abhayachandra Jain and Vinay Kumar Sorake and MLAs Pramod Madhwaraj, Moidin Bava, MLC Ivan D’Souza and MUDA Chairman Ibrahim Kodijal. When asked by scribes about the letter earlier addressed by him to party men expressing unwillingness to contest, Shetty said though he wanted others to be given an opportunity to contest, he had to yield to the demand of the party workers who wanted him to contest. Refuting allegations that he has not been active in party, Shetty said he has been regularly attending all meetings of local bodies. When asked about the rebel candidates, Shetty made a veiled attack on Jayaprakash Hegde stating there was no need for the party to be embarrassed and that those who had come from other parties should feel so. Rebel Congress candidates Jayaprakash Hegde and Bhujanga Shetty who are contesting as independents arrived along with several party workers to file nomination. Meanwhile, speaking before the procession commenced in Brahmavar, Hegde and Shetty clarified that they were independent candidates and not rebel candidates. He also wanted the Congress to clarify as to why it has fielded Pratapchandra Shetty when there were so many other eligible candidates. He also claimed that many party workers were supporting him and Bhujanga Shetty. Later speaking to media men in Mangaluru after filing nomination, Hegde said he would not be quitting Congress and added his main demand was that an active worker need to be fielded. "I will withdraw my nomination if the party fields some other able candidate by December 12," he said. Jayaprakash Hegde’s daughter Divya said the Congress has to listen to the voice of its workers before fielding candidates.